Yesterday was our wedding anniversary, our fourteenth to be exact, and even though it was a school night, we decided to go out to celebrate. After all, fourteen years is rather a long time. Now, obviously there’s no show without Punch, so Miss Kimber Dounis would have to come too. 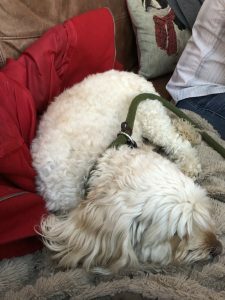 Thankfully there are so many great places to eat in Edinburgh that also welcome canine members of the family, so we were a little spoiled for choice. Normally that means we can’t make up our minds and end up reverting to our standard go-to, but we fancied a bit of a change. We decided that since we hadn’t been to Cafe Tartine for a while, and we hadn’t been for dinner for quite a bit longer, we would go there. It’s a French cafe/restaurant/bistro type place, and the food is always very good. I made a reservation through their website, but the booking form didn’t have room to tell them that we were bringing Kimber until after we’d made the booking. In some places that wouldn’t matter, but at Cafe Tartine, dogs are restricted to the Conservatory so I called up the next day just to make sure we could get a table in there. Sure enough, they hadn’t got the message, so my advice if you’re dining with dogs is to call up to make your reservation. The best thing about Cafe Tartine’s location is that there’s heaps of free parking during evenings and weekends. But we were having a celebration, and Scotland’s drink-driving limit is so low that you daren’t risk even one glass of wine. Public transport from our house to Leith is non-existent, so we ordered a taxi. One of the larger taxi companies in Edinburgh now has a phone app, which makes ordering a taxi a breeze. You can even see how many taxis are near your location and exactlywhere they are. I love it. You’re probably reading this and thinking ‘well duh! Taxis have had apps for donkeys years!’ but I’ve only just discovered how handy they are. I do get the whole Uber thing, but whenever I’ve used them, I’ve found that the fare they state doesn’t always end up as the fare I pay, and I’ve been stung by having to pay for a taxi that left me stranded at a train station in the middle of nowhere at midnight, all because I was a few minutes late for the pick-up, even though I’d been sending the driver messages. Anyway…. I’m happy to report that Cafe Tartine was just as good as we’d expected. We shared a couple of starters: squid pil pil and a prawn and chorizo dish that was on the specials menu. Then the husband had the pork belly, and I had moules frites. The mussels are bought fresh every day, and they were beautifully cooked with a delicious broth. I was too full for one of their fabulous crepes, but managed the best chocolate mousse I’ve had for a long time, with a tiny bit of help from the husband. All washed down with a lovely, and reasonably priced, bottle of Picpoul.